The FTD Blanket of Flowers is a beautiful adornment for the top of their casket at the final farewell service. 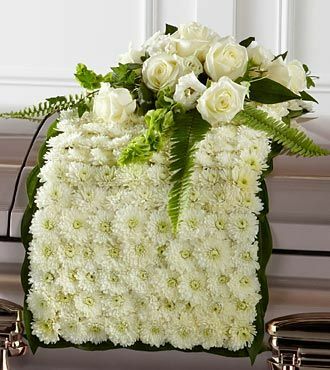 White chrysanthemums form a blanket of blooms that drape across the casket accented with an arrangement of white roses, white double lisianthus, Bells of Ireland, ivy, sword fern and a variety of lush greens to create an exquisite look of sweet serenity to honor the life of the deceased. Blanket is approximately 48L x 42W.